Aloha and Welcome to Lava Java Coffee Roasters of Maui! Lava Java’s 100% Maui grown coffees have been our “claim to fame” since opening our doors over 10 years ago. From the misty slopes of Haleakala to the sun-kissed plantations of the West Maui Mountains, we procure beans from all over the island to roast and package ourselves. See for yourself why our Maui beans make the best cup of coffee you’ve ever had! 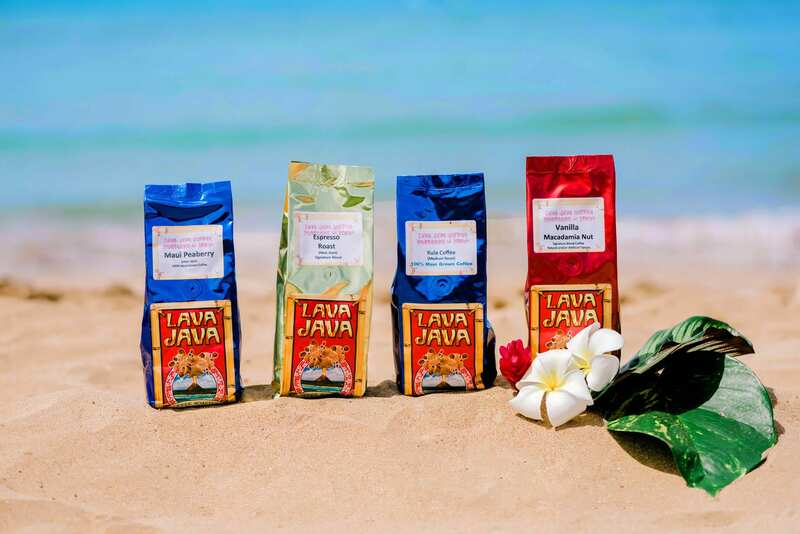 Lava Java’s flavored coffee selection is truly remarkable because we use the highest quality island-inspired flavorings on our 100% Colombian Supremo, 18-screen beans roasted right here on Maui. Whether you enjoy a nutty flavor, fruity flavor, or a mix of both, we have the flavored coffee for you! Lava Java’s 100% Colombian coffees are all extra-large, 18-screen beans roasted to perfection right here on Maui. Whether you prefer a bold French roast, a lighter Full City roast, or a mix of both in an Espresso roast, we’ve got you covered! The newest addition to Lava Java’s coffee collection is our 100% Colombian Peaberry. These coffee beans occur in approximately 1 out of every 25-30 coffee cherries harvested, and have a 30% higher oil concentration than a normal bean. Roasted right here on Maui, we promise that if you try it once, you’ll be hooked! You’ve just landed at Lava Java Coffee Roasters of Maui, the best island stop for premium Maui-grown Hawaiian coffee. We are nestled in the Kihei Kalama Village, across from Kalama Park, just steps from the shimmering blue ocean and warm tropical sand. If you are looking for an amazing coffee experience, whether hot or frosty, you have come to the right place! Indulge yourself with coffees grown right here in our rich volcanic soil.